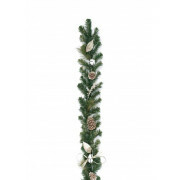 Glistening silver accents really set of this stunning garland. With jingle bells, silver leaves and real pine cones. Looks great on a mantel piece, window sill, on the banister of the stairs.